You can format settings for fonts, alignment, shading, borders, lines and tooltips at the worksheet level. For example, you might want to remove all the borders in a text table, or add shading to every other column in a view. When you make formatting changes at this level, they apply only to the view you're working on. See Format at the Workbook Level for how to make changes that apply to every view in your workbook. Display a worksheet or dashboard. From the Format menu, choose the part of the view that you want to format, such as Font, Borders, or Filters. For a view, you can specify the font, style, size, and color for either the pane text or header text, or both. 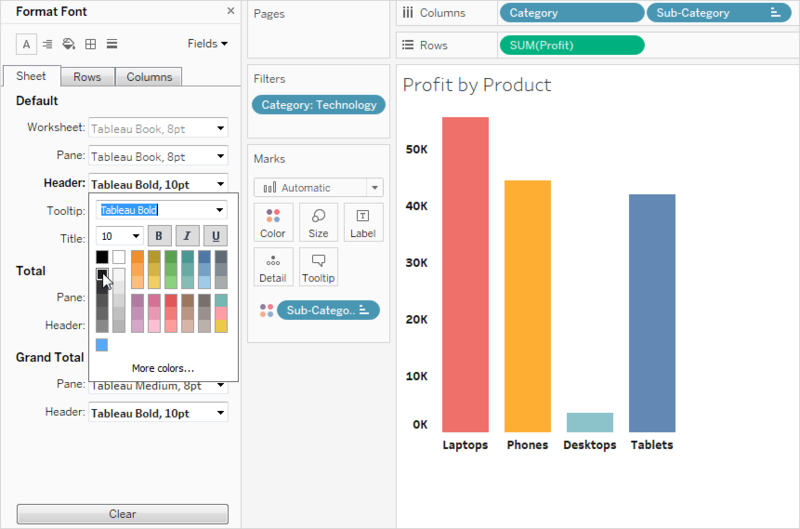 For example, in the view below, the header text is set to use the Tableau Bold font. If you have totals or grand totals in the view, you can specify special font settings to make these values stand out from the rest of the data. This is particularly useful when you are working with a text table. The view below shows a text table in which the grand totals are formatted to be dark red. 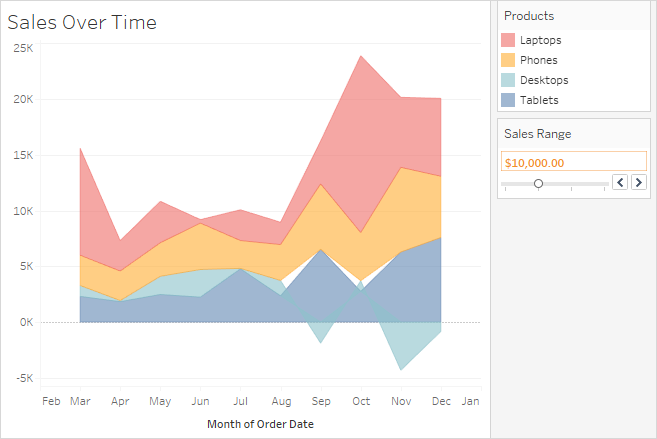 Tableau uses visual best practices to determine how text is aligned in a view, but you can also customize text. For example, you can change the direction of header text so that it is horizontal (normal) instead of vertical (up). 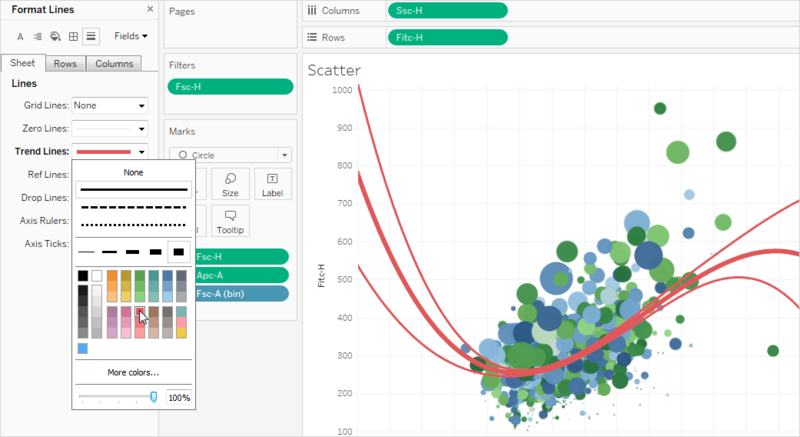 Note: Tableau adheres to regional standards when determining when to begin or end line breaks. Horizontal - Controls whether text aligns to the left, right, or center. Vertical Alignment - Controls whether text aligns at the top, middle, or bottom. Direction - Rotates text so that it runs horizontally (normal), top-to-bottom (up), or bottom-to-top (down). Wrap - Controls whether long headers wrap to the next line or are abbreviated, but does not control text marks. Note: If cells are not large enough to show more than one row of text, turning on wrapping will have no visible effect. If this happens, you can hover the cursor over a cell until a double-sided arrow appears, and then click and drag down to expand the cell size. 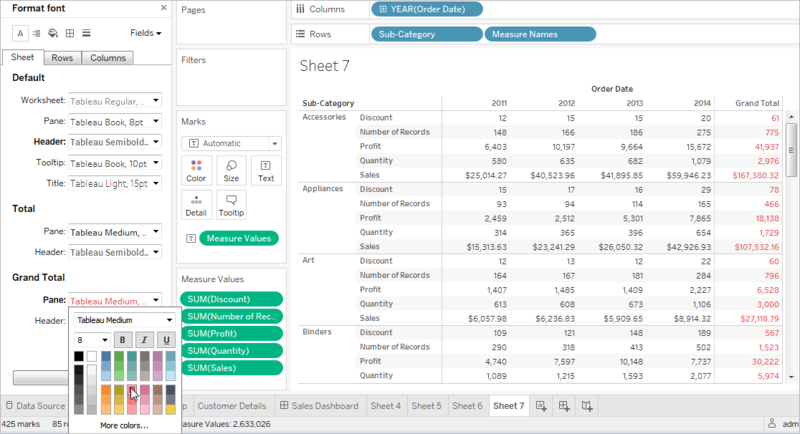 Shading settings control the background color of the pane and headers for totals, grand totals, as well as for the worksheet areas outside those areas. You can also use shading to add banding, alternating color from row to row or column to column. Banding is useful for text tables because the alternating shading helps your eye distinguish between consecutive rows or columns. Pane and Header- The color the bands use. Band Size - The thickness of the bands. Level - If you have nested tables with multiple dimensions on the rows and columns shelves, this option allows you to add banding at a particular level. Row and column dividers serve to visually break up a view and are most commonly used in nested text tables. You can modify the style, width, color, and level of the borders that divide each row or each column using the row and column divider drop-downs. The level refers to the header level you want to divide by. You can control the appearance of the lines that are part of the view, such as grid lines and zero lines, as well as lines that help you inspect data, such as trend lines, reference lines, and drop lines. The highlighter on your worksheet can be formatted to use a different font, style, color, background color, font size, and border. Formatting highlighters allows you to better integrate them into your dashboard or worksheet style. You can also edit the title that displays on each highlighter that shows in the view. For more information about using highlighters, see Highlight Data Points in Context. Filter cards contain controls that let users interact with your view. You can change filter cards to use custom formatting. 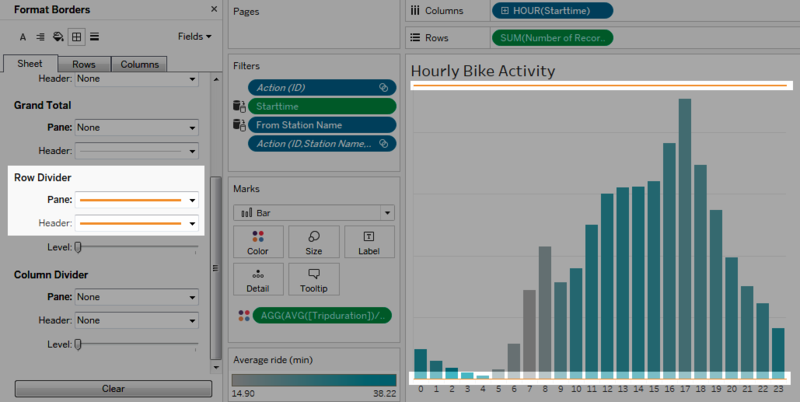 For example, the body text in the filters below is formatted to use the Tableau Bold font, in aqua. Note: For filters and parameters, title formatting appears only on dashboards or in views published to the web. Parameter controls are similar to filter cards in that they contain controls that let users modify the view. If you create a parameter control, you can customize how it looks. For example, in the view below, the Sales Range parameter is formatted so that the sales amount appears in orange. After you format a worksheet, you can copy its formatting settings and paste them into other worksheets. The settings that you can copy are anything you can set in the Format pane, with the exception of reference lines and annotations. Adjustments like manual sizing and level of zoom are not copied. Select the worksheet from which you want to copy formatting. Right-click (control-click on Mac) the worksheet tab and select Copy Formatting. Select the worksheet you want to paste the formatting into. Right-click (control-click on Mac) the worksheet tab and select Paste Formatting.